For various reasons, this is a very special image for me. It is my first one to be published on 1x.com and my first one to appear in an international magazine (Digital Camera-UK in the August issue 2014). I remember unintentionally getting up way too early and in total darkness due to the time shift among the US states and after having an encounter with what might very well have been a mountain lion, I finally arrived at the edge of Bryce Canyon, when a distant thunderstorm began. I knew I was in for a great light show and after spending some time trying to capture lightning bolts with longer exposures, I finally was patient and lucky enough to get one right in the middle of the frame. The finished image is the best example for me that dedication and patience really pay off in the end. We can find a strong will to live in places, where we might not expect it. And the neighborhood can seem very uninviting. Sunrise accompanied by some coyote howling at Joshua Tree. 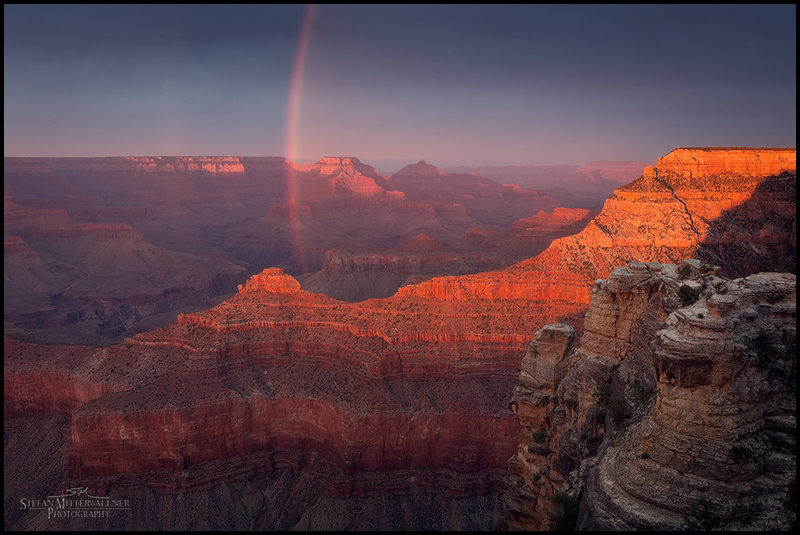 An unbelievable vista at Grand Canyon, USA. Having had heavily overcast conditions the whole day, the sun came out for the first time right at sunset providing even a rainbow for some unforgettable atmosphere. Sun rays breaking through right at sunset after a heavily overcast day at Monument Valley. 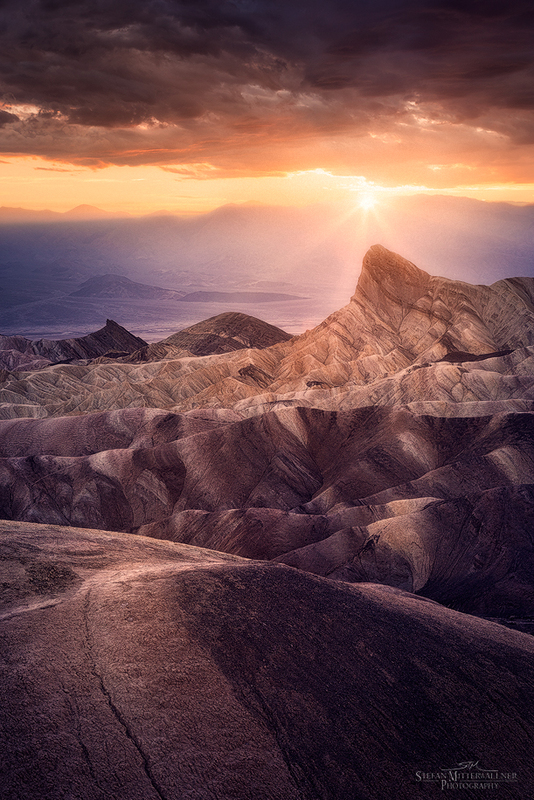 Sunset at Death Valley, USA. Some stunning lightshow at Grand Canyon, USA. Some iconic shapes in the distance and a dramatic sunset at Monument Valley. 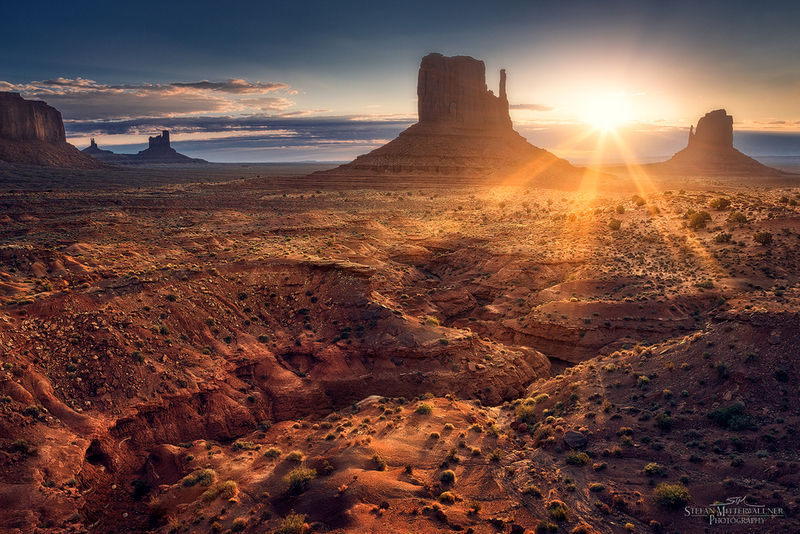 Sunrise at Monument Valley, softly touching Dinosaur's land. 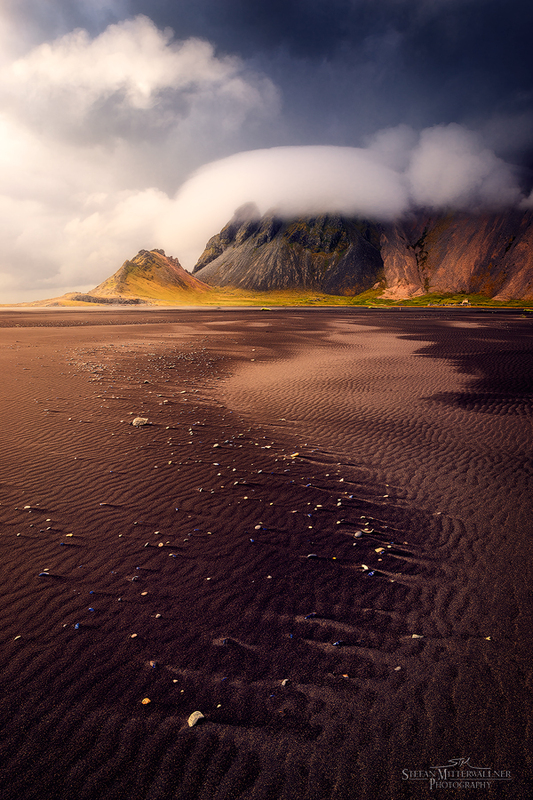 On a very cloudy day at the Vestrahorn in southeastern Iceland, I was lucky to have the sun break through for a few minutes, which added some warmth to that pretty surreal scenery. Midnight sun in Iceland is an amazing experience. Water breaking over shore rocks at midnight in Iceland. 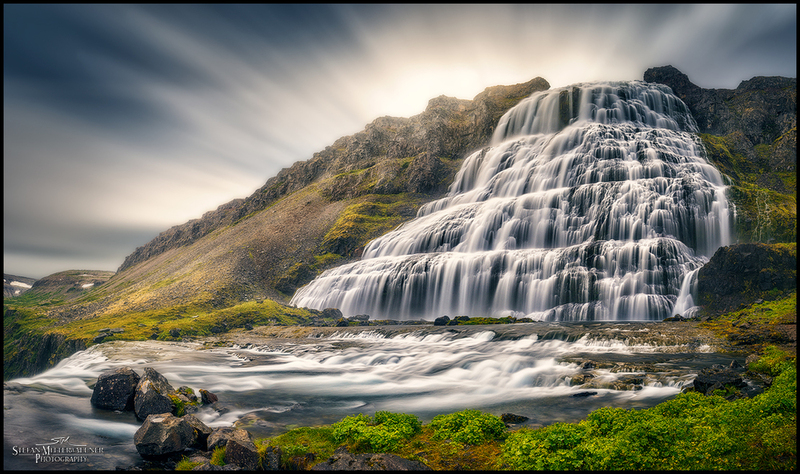 This is a long exposure panorama of the amazing Goðafoss, certainly one of the most beautiful waterfalls I have seen. On a personal note, I missed the Soccer World Cup Final 2014 due to shooting Goðafoss in that particular night, but even being a Soccer fan, it was well worth the sacrifice. This image was published on 1x.com. Shooting Goðafoss on that evening is still a very vivid memory. The soccer fan in me wanted to watch the World Cup Final 2014 badly, but luckily the photographer had the last word, since I had very limited time in Iceland. I had luck on my side and the sun breaking through, which added all the warmth to this beautiful scenery. A long exposure 2-shot pano at Goðafoss, Iceland. 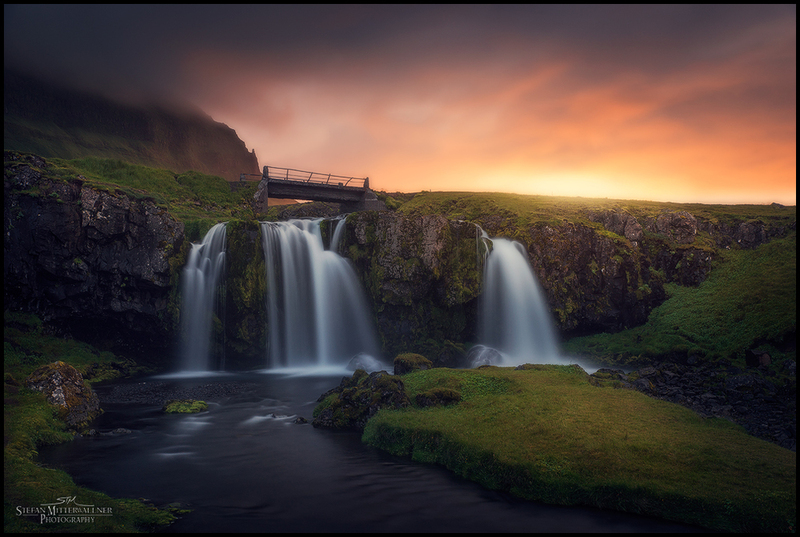 Sunset orchestrations at a waterfall in south Iceland. 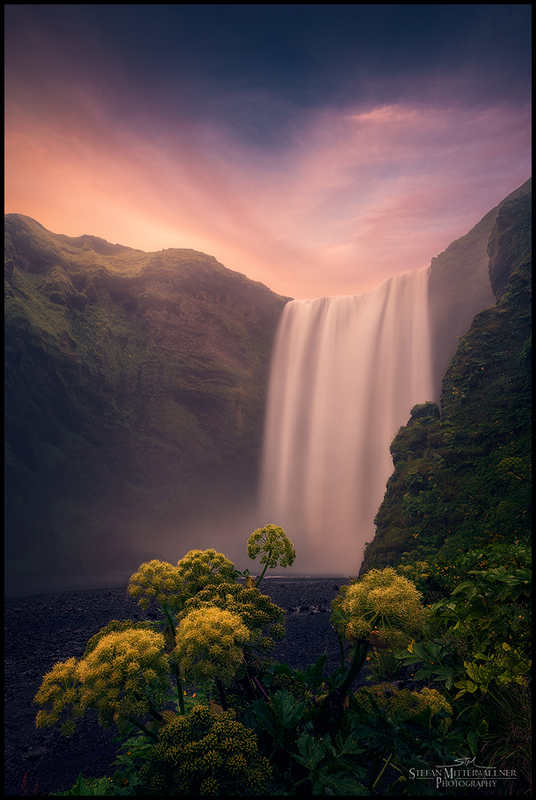 Dreamy sunset at Skógafoss, Iceland. Recognized with an "Editor's Choice Award" at 500px.com. 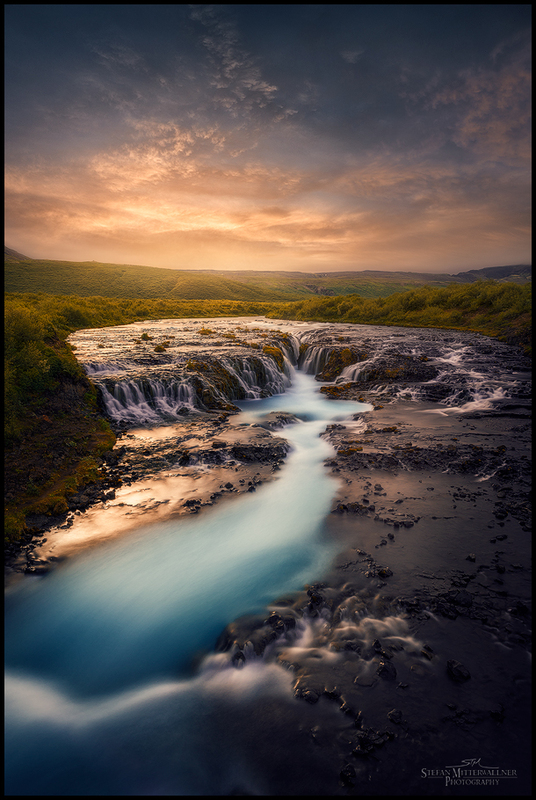 Some magic light display at Brúarfoss, a very well hidden gem in Iceland. Midnight sun over Westfjords, Iceland. You find some totally untouched, raw and peaceful nature in those remote places. 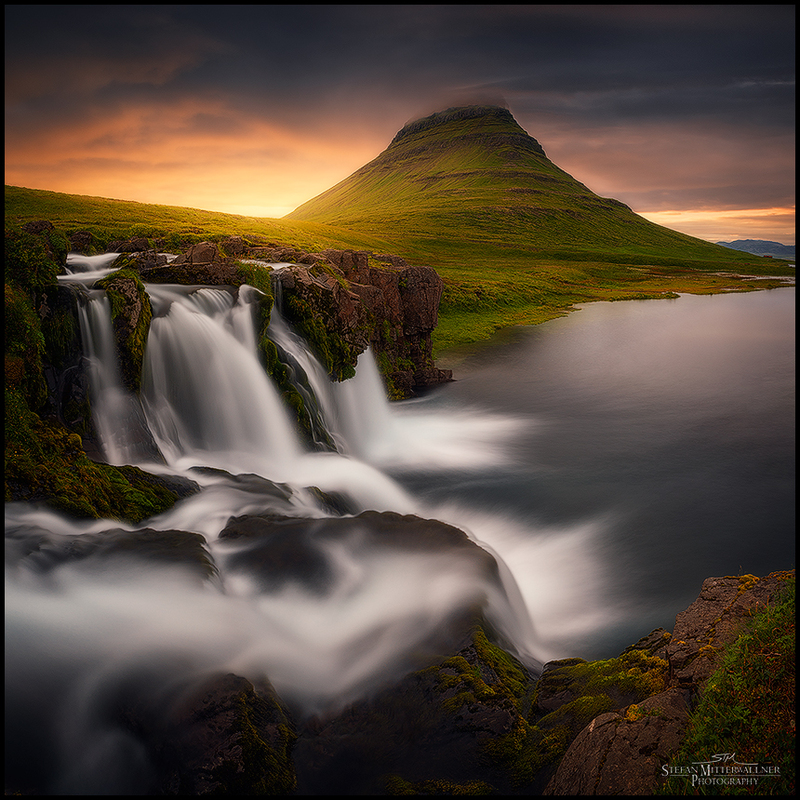 Soft sunset light at the very surreal scenery at Kirkjufell, Iceland. Out of a fairy tale- Kirkjufellsfoss, Iceland. Kirkjufell touched by some magic sunset light. Sun greetings after a short shower at the amazing Seljalandsfoss, Iceland. This image ranked 1st in all photography categories at 500px.com on 30.10.2014. Soft veil of fog at Kirkjufellsfoss, Iceland. Soft light touch over a small, charming waterfall at Westfjords, Iceland. There are many unbelievable waterfalls in Iceland and Dynjandi is one of the less known and more remote ones. It took me a long time driving on pretty bad roads to reach it and I didn't regret it a second when I finally was in close proximity to the incredibly powerful and huge Dynjandi, Iceland. Dynjandi, Iceland. There is almost a spiritual quality to this breathtaking waterfall. This image was published on 1x.com and can be found on many places on the web. 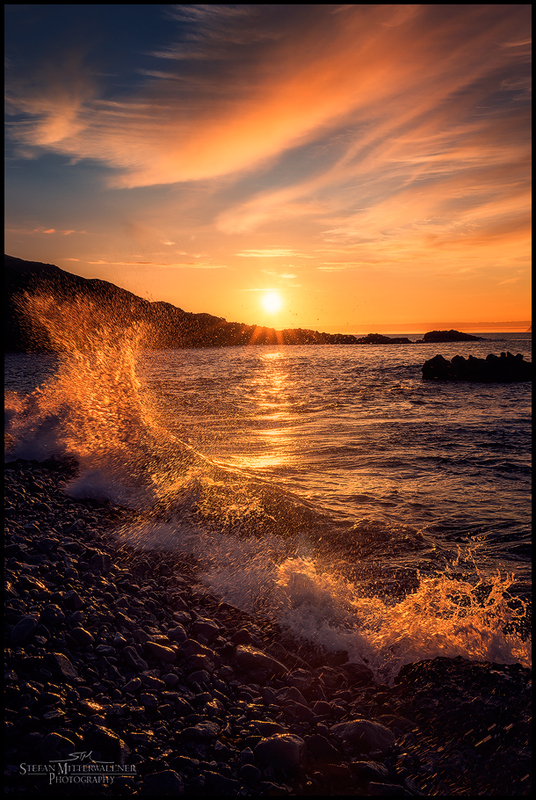 Midnight sun at Westfjords, Iceland. Among many iconic, famous and amazing waterfalls in Iceland, Brúarfoss is still considered to be kind of a hidden gem. It took me a long time to find it but it was well worth the effort. You don't believe the deep blue color until you actually see it yourself. A close study of the fascinating Brúarfoss, Iceland. You certainly feel small in front of Dynjandi, Iceland. Dynjandi is certainly one of the most fascinating waterfalls I have ever seen. There is such an innate beauty and majesty about it that is hard to capture. I knew I was in for something special when the veil of fog appeared, which added another quality to the already very mystical scenery. Confluence of many charming falls at Hraunfossar, Iceland. Some raw, untouched nature at Westfjords, Iceland. 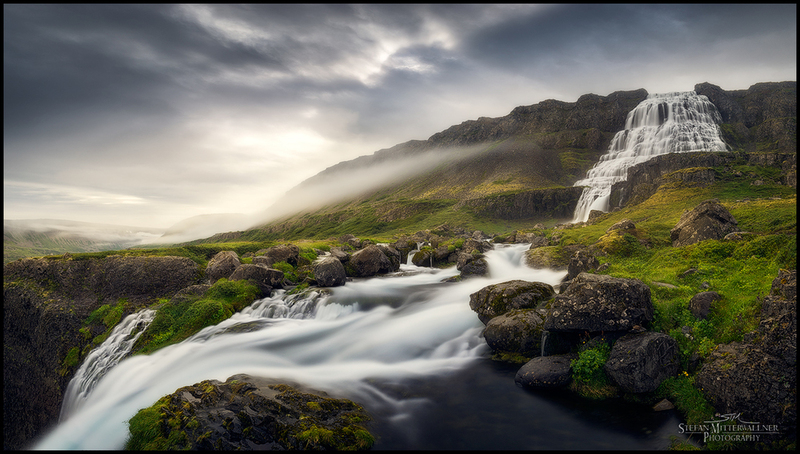 A panoramic shot of the mystical Öxarárfoss, Iceland. Iceblocks like Diamonds on the black sand beach at Jökulsárlon, Iceland. Beast's rock of Hvitserkur, Iceland. Some mystical sunset scenery at Salzburg, Austria. You truly get a sense of scale and power of nature when you get close to Skógafoss, Iceland. An abstract rendering of falliing water and the essence of Dynjandi, Iceland. The Milky Way and coyote's howling at Joshua Tree National Park, USA. Nightrest at Joshua Tree National Park, USA. 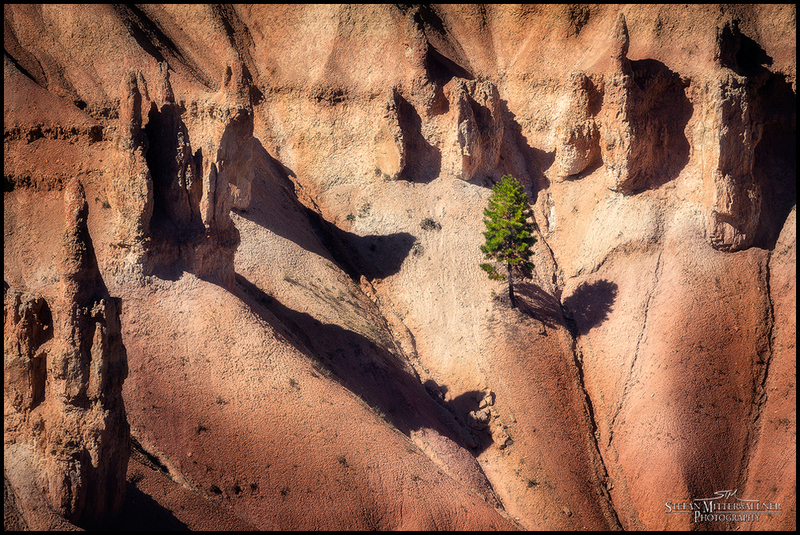 Force of Nature at Bryce Canyon, USA. 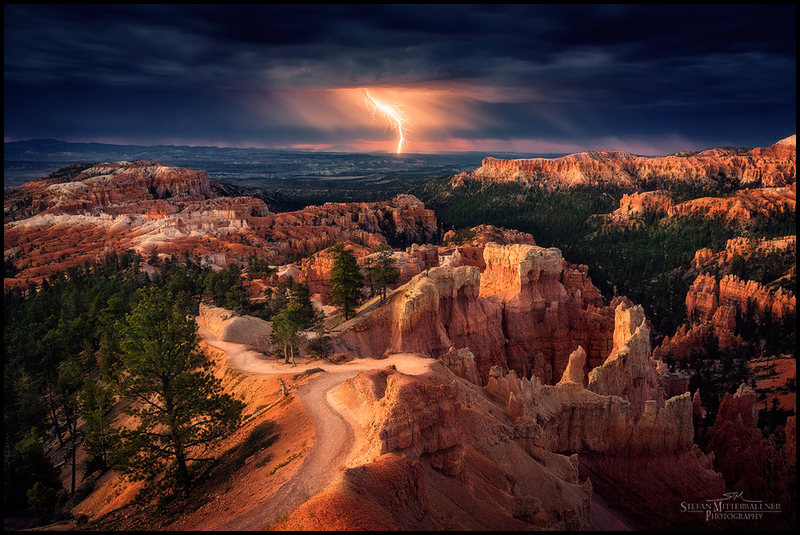 A fierce storm approaching at Bryce Canyon, USA. Deep winter sunrise at Windischgarsten, Austria. Deep icy silence at Jökulsárlon, Iceland.